"It is better to choose a person I know rather than a stranger. Thus says an Egyptian proverb. I am not a political scientist but, knowing the Egyptians a bit, I believe they will eventually choose Abdel Fattah al Sisi". This is an empirical analysis that Egyptian Franciscan friar Fr. Mamdouh Chéhab gives to Agenzia Fides, based on feelings and not on detailed studies. The impression is that, both for lack of rivals and because he is still seen as a bulwark against extremism, president al Sisi will still triumph. Mousa Mustafa Mousa's rival of the el Ghad party is too weak to threaten the current president in the elections to be held from 26 to 28 March. "On the other hand - continues Fr. Chéhab – in Egypt those who had the support of the armed forces have always won. Think of Nasser, Sadat, Mubarak. Al Sisi, who comes from the army ranks, is in continuity with this tradition. He represents the strong man behind whom the generals' presence is present and solid. Hardly anything will change". The support of the armed forces, however, is not the only ace up the president’s sleeve. 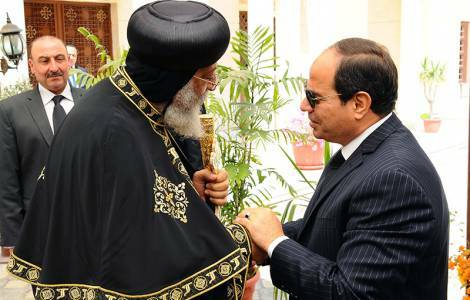 "In these years - explains Giuseppe Dentice, PhD student of the Catholic University and researcher of the Middle East program of the Institute for International Political Studies (ISPI) of Milan - al Sisi has woven a dense web of relationships and support throughout the country. Magistrates, policemen, bureaucrats, entrepreneurs, etc. stand next to him. This system of friendships will help him together with the support of the military, which, however, remains vital also because officers manage an important part of the national economy".